Ever thought of eating butter, bacon and tons of cheese in order to lose weight? I put myself on a ketogenic diet for one month to see how my body would react to it. 140 grams of fat a day and still losing weight?? The whole regiment seemed silly to me at first, but I couldn’t be more happy with the results! This is by far the most personal story I have posted so far on my blog. I like a challenge and try new things in all kinds of ways – I’m my personal favorite guinea pig! This also inspired me to write about weird flavor combinations shortly before starting my keto diet. 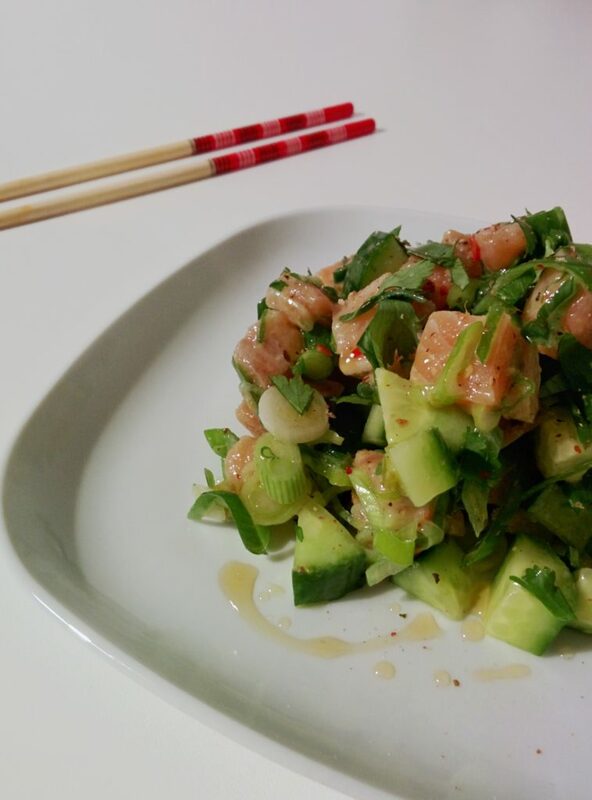 You can check out my second book “Flavor Math” by clicking on the link. If you think a keto- or low-carb diet is right for you, you can download the free keto dashboard underneath to track your carbohydrate intake and make sure you stay in ketosis. It actually also works just as a regular food tracker as well. This is what a proper keto meal looks like! 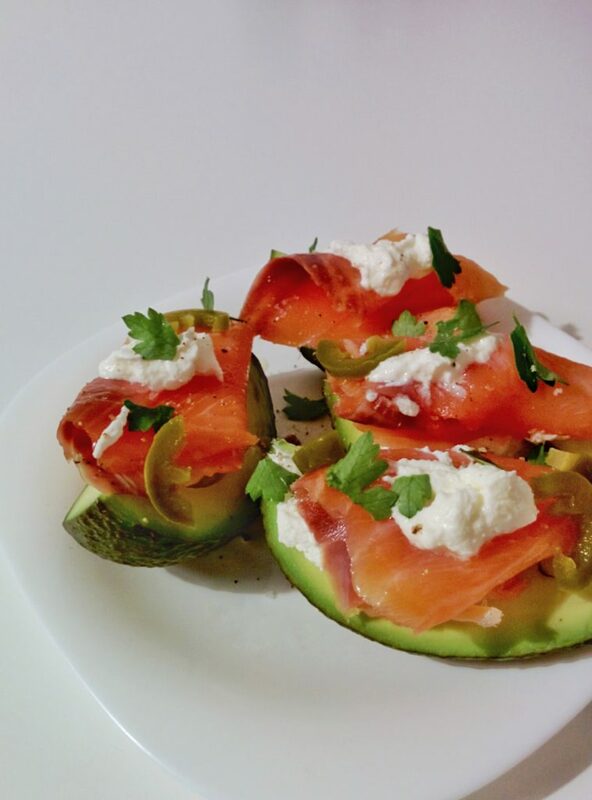 Avocado filled with sour cream and smoked salmon! 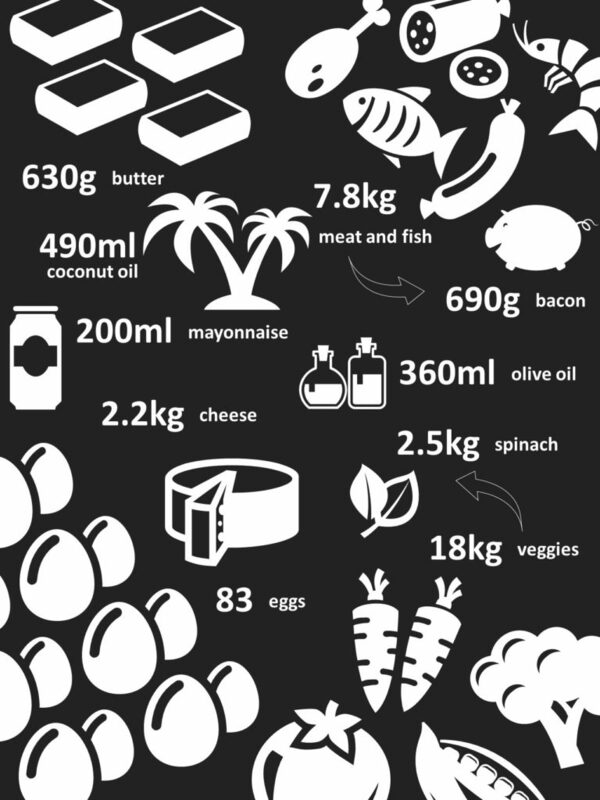 Lots of healthy fats that will give you energy and keep you filled up for long! Going on a ketogenic diet basically means trying to avoid pretty much all carbs. The idea is that your body switches energy sources. Instead of burning primarily carbohydrates, you let your body burn fat as its primary energy source. Once the carbs are out of your body your liver will start converting fat into ketones, which can then be used as fuel and energy for your body. As you hardly consume carbs your insulin levels are much more stable, which means your body won’t store excess fat but actually burn more of your stored fat instead. This is the same idea as in the Atkins diet. Some even call keto “Atkins on steroids”, because it can be even more strict. Why I did this diet? Even while working out 5 times a week I kept my ‘love handles’. I was gaining muscle and I was losing weight, but in the end, the stored fat remained where it was. Keto is aimed to burn just that excess body fat that you have. I, therefore, hoped that going keto would help me to lose that extra stubborn fat that never seemed to go away. At that point in my life, I was terribly afraid of stepping onto the scale. Of course, I knew I was severely overweight, but I was terrified of actually knowing that number. I can’t remember why I did it, but one day I did step on the scale. Maybe deep inside I already knew that something had to change. When I did take that step onto the scale and the display showed 122 kilos, I felt like crying. I was angry at myself for letting this happen to me. This was the moment when I decided I wanted to truly change the course of my life. One of my best personal qualities is dedication. Once I set my mind to something, it will happen – at all costs. I started doing WeightWatchers and learned about all the hidden calories in soda’s as well as processed and fast foods. Knowing this I realized that I had easily put 3,000-4,000 calories into me every single day for the last years. Vegetables and salads became my go-to choice and I reduced red meat to a minimum. To still be able to go out and drink with my friends, I would only eat vegetables and skip meals during the week just for those few beers during the weekend. My goal was to drop 30 kilos and end up at 90 kilos. It took me 1.5 years, but I did it. It was a slow painstaking process, but I did it! The moment I stepped on the scale and the displayed showed 89 kilos I was so happy and so relieved. The reason why I started to lose weight was not for other people – I did this for myself. Once I reached my goal I could not have been prouder of myself. Even now more than 10 years later, this is still one of the biggest achievements of my life. I literally lost 1/4 of my body. 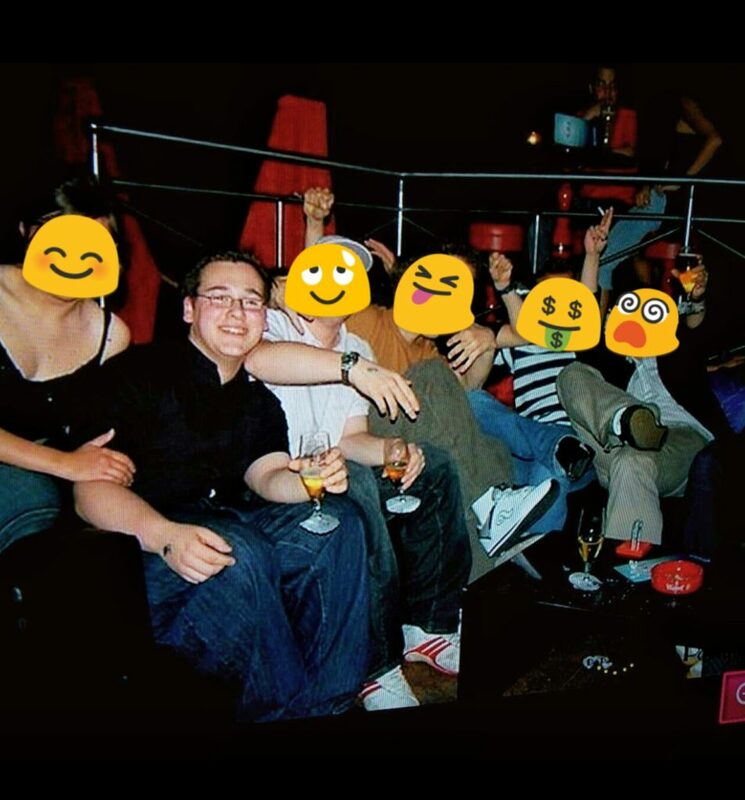 I promised myself I would never end up above 100 kilos ever again in my life! After stopping with WeightWatchers I was able to keep my weight rather controlled in recent years. It now usually bounces around somewhere between 83 and 87 kilos and it does not matter if I go to the gym 1 time a week or 5 times. Still, that stubborn body fat rather stays where it is. They say losing weight is 80% in the diet and 20% in exercise, right? With WeightWatchers, each food gets assigned a certain amount of points. With the regime, I followed back in 2005 (flexipoints) these points were primarily based on a formula of calories multiplied by fat. Which means foods high in fat always have very high amounts of points. E.g. a sausage is about 10 points. My daily limit back in the day was 27. This way you are encouraged to eat primarily veggies and fruit, given they pretty much all have 0 points. Eating 2 kilos of carrots, onions, and apples a day would still mean 0 points consumed. Carb consumption would not be discouraged. A slice of bread would have 1 point, a bread roll 2. A tablespoon of oil? 3 points. You see how this ends up to a high carb, low-fat diet, which is pretty much the polar opposite of a ketogenic! Given I actually learned through WeightWatchers which foods are “healthy” and which ones are not I initially struggled so much with keto. How can eating big portions of broccoli, tomatoes, and carrots be worse than eating half a stick of butter wrapped in bacon? 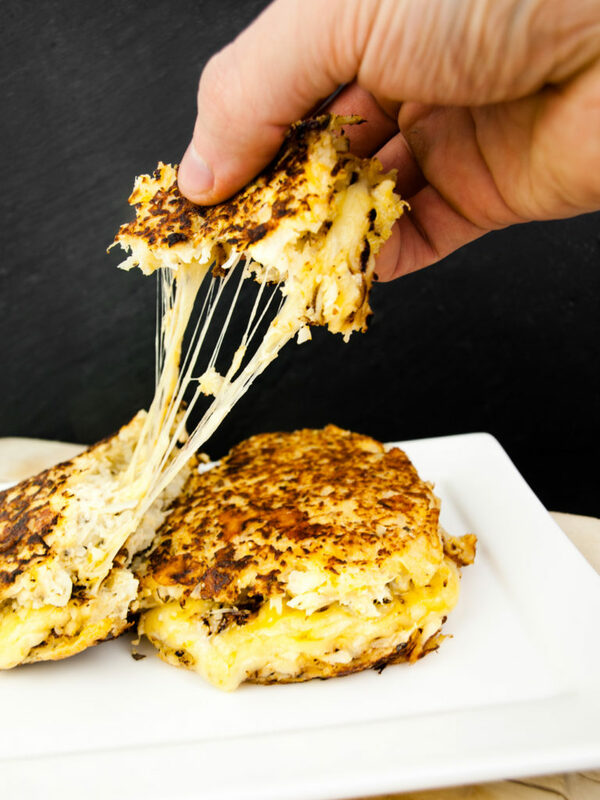 Gooey cauliflower ‘grilled cheese sandwich’ – Lots of molten cheese between patties made of grated cauliflower, parmesan cheese and egg. How can this be ‘healthier’ than a pineapple? My initial keto approach stopped before it even began. I tend to always seek out extremes and for keto, this is staying under 20 grams of carbs a day. This meant looking up every single ingredient on the internet and measuring everything just to be sure I would stay under that magical limit. Following a strict keto diet with the aim to lose body fat, I was allowed to eat 1840 Kcal, 140g fat, 20g NET carbs, and 125g of protein in a day. With most vegetables still having some carbs in them, I was hitting the 20g limit way faster than I was expecting! For me, it felt really unnatural to eat so little vegetables. After only 4 days, I recalculated my macro’s and moved to 30g NET carbs while still holding on to a 20% calorie deficit. The reason for that was that I really wanted to get my 5 portions of veggies a day in. I was eating 1664 Kcal, 124g fat and 108g protein, and luckily my body still stayed in ketosis. 14 days into my ketogenic diet I stepped on a scale for the first time. I was surprised that I lost 4 kilos in 2 weeks, while eating so much fat and feeling full all the time. For me personally, it felt like I was losing weight too fast though. It felt like a good choice to reduce my calorie deficit from 20% to only 10%. For the rest of the month, I tried to stick with 1849 Kcal, 144g fat, 108g protein while still holding onto a maximum of 30g NET carbs a day. A lot of people are afraid of the side effects when starting keto. Being irritable, headaches, fatigue, etc. For me personally, these effects were rather limited and passed quickly. Weeks 1-2: Usually I seriously crave salty snacks like chips or nuts during the week. This feeling was completely gone immediately after doing 2 days of keto. I felt really filled throughout the whole day. After 3-4 days for some reason, all colors felt a bit more vivid as well. I experienced this once earlier when I was coming out of a light depression. So, I can’t tell if this was really keto related. What worried me a bit was the fact that I had very ever so light pain in my stomach a few times after eating a big fatty meal. After pretty much exactly a week I had an appointment in the morning with my physical therapist. I go there every once in a while, to get back cracked. He said: “Did you already eat today? I can smell acetone on you. You don’t have sugar sickness (the Dutch term for Diabetes), right?” I haven’t had eaten that day yet, but I realized that I was finally in ketosis. Ketones are of the acetone family and science suggests that ketones on your breath are a rather reliable indicator that you are indeed in ketosis. I did feel a bit light-headed at some times the next days. Week 3-4: In week 3 I had serious sugar cravings for the first time. However, after eating some salted peanuts and drinking a can of diet soda this went away quite easily. The more my body adjusted to the new diet the more I actually felt hungry from time to time in-between meals. This was the time that I realized I haven’t had the proper feeling of hunger in months, maybe years. We are all so accustomed to eating at certain times of the day or whenever food is available that we forget to actually listen to our bodies. It felt good to have that hunger feeling back! On top of that, I was thirsty aaaall the time and drank considerably more water than what I was used to. Yes – I cheated! In the 31 days I was following keto I fell off the wagon a whopping 9 times… Do you want to know what the main reason was? Alcohol! Two of my vices are craft beer and red wine. While having a few beers will kick you out of ketosis in the blink of an eye because of its high carb content, red wine turned out to be the more conscious choice. The average glass of red wine comes down to only 2.5 grams of carbs. You can sneak in a few glasses of wine now and then, but as we all know alcohol leads to reduced inhibition. Less self-control also means that you’ll sneak in an additional bite of this and an extra serving of that. Voila, you just blew through your macros for the day when having a few drinks with friends and colleagues. Next to that, there were two times where I thought I was making good choices when eating out, but was ultimately surprised by the amount of carbs that were in the dishes I ordered. On one occasion I just threw my keto diet out of the window, because I was attending a wedding. You have to live a little now and then, right? Whatever diet you are following, don’t feel bad if you fail one day of your regiment. The most important thing is that you realize what happened and why it happened. Pick yourself up and try again – new day, new chances! 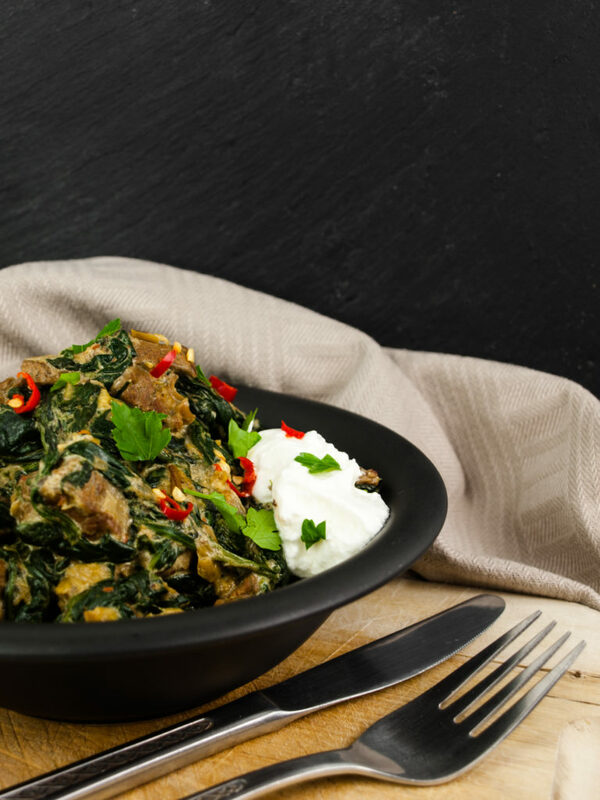 Delicious Indian lamb curry with lots of spices, tons of spinach and full-fat yogurt. Totally keto friendly. Who needs rice when you can get two more spoonfuls of this tasty curry? Actually toning muscle with fat! For me weight is not about a number anymore, it’s about feeling awesome in your own skin. The last months (even before doing keto) I went to the gym around 5 times a week, lifting mostly weights and only doing cardio occasionally. The combination of doing this while also following a ketogenic diet turned out quite spectacular. In total, I lost 6 kilos of weight doing 1 month of keto. I was afraid I would actually lose muscle doing this little experiment. It turned out that the opposite was true! 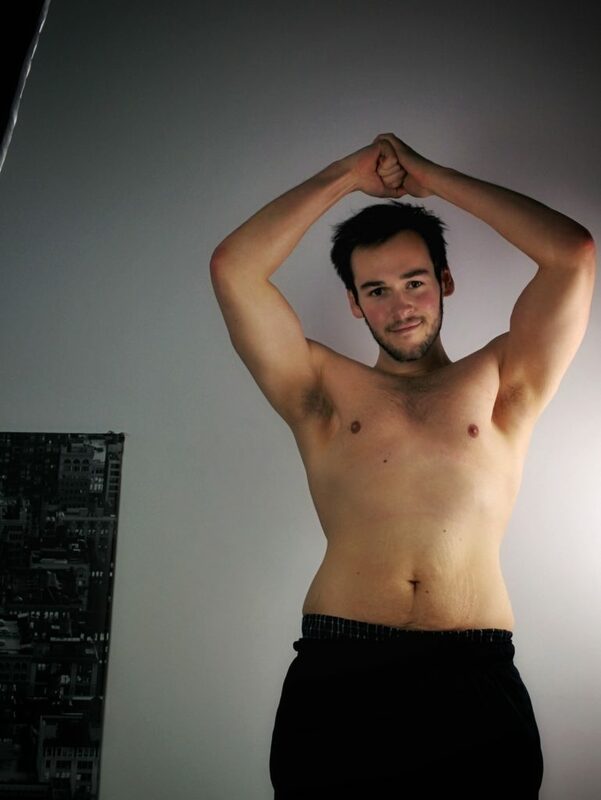 Even though I lost 4-5 centimeters on both my waist and my hips, I was still able to build quite a substantial amount of lean muscle at the same time. The scale says I lost 6 kilos of weight, while still being able to tone some muscles. Have to say that I’m happy with the results! I initially wanted to call this article “A meat lover’s dream but a flexitarians nightmare”, because the thing that bothered me the most about the ketogenic diet is the fact that it forced me to eat so many animal products. Usually, I would consider myself a “flexitarian” – in a normal week, I would eat meat 2-3 times a week. In order to keep up my protein intake, get enough fat in, but still staying on the low side in terms of carbs, I needed to eat more animal products. Eggs, cheese, meat, and fatty fish became my primary choices when following keto. However, I still tried to get my 5 portions of veggies a day in. This meant I had a lot of spinach, iceberg salad, broccoli, cauliflower and mushrooms in the last weeks, as they are all low in carbs. There is probably only one thing that being vegan and going keto have in common: Tons and tons of fake stuff and replacements! Cauliflower hash browns, cauliflower-grilled cheese, ‘pasta’ made purely from cheese and egg, burgers made with tomato as a bun, green bean fries… Don’t get me wrong a lot of this stuff was absolutely delicious but it really has nothing to do with the real thing. My keto experience in numbers! On average I ate 1782 kcal, 129 grams of fat, 26.6 grams of carbs and 106 grams of protein a day. As you can see in the image above, I ate a looooot of eggs, lots of butter and a substantial amount of cheese. Even when following a keto diet it’s possible to get a very solid amount of veggies into your days. Even though it seemed ridiculous and paradox to eat fat in order to lose fat – it really works. I lost 11 pounds while still gaining lean muscle. Physically I feel great and I can only recommend to everyone to try keto at some point in your life. Keto forces you to deepen your knowledge about food, sugars, and nutrition. You need to cook fresh and from scratch a lot to get the macro’s you need. 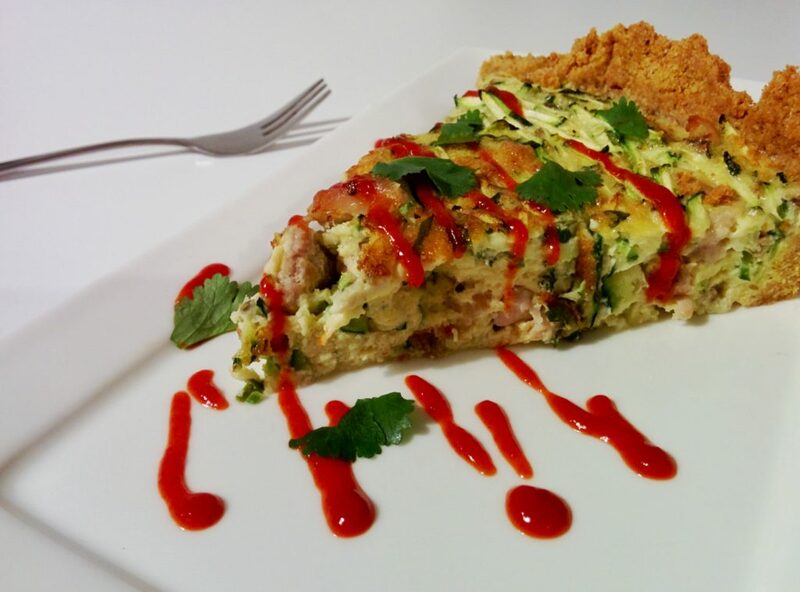 In the month of doing keto, I tried 33 new recipes because I was cooking 2 or 3 times a day. I learned that it’s quite easy to skip unnecessary carbs. You can easily skip the rice when you are eating Thai or Indian curry by simply adding an extra portion of veggies and eating it like a stew. 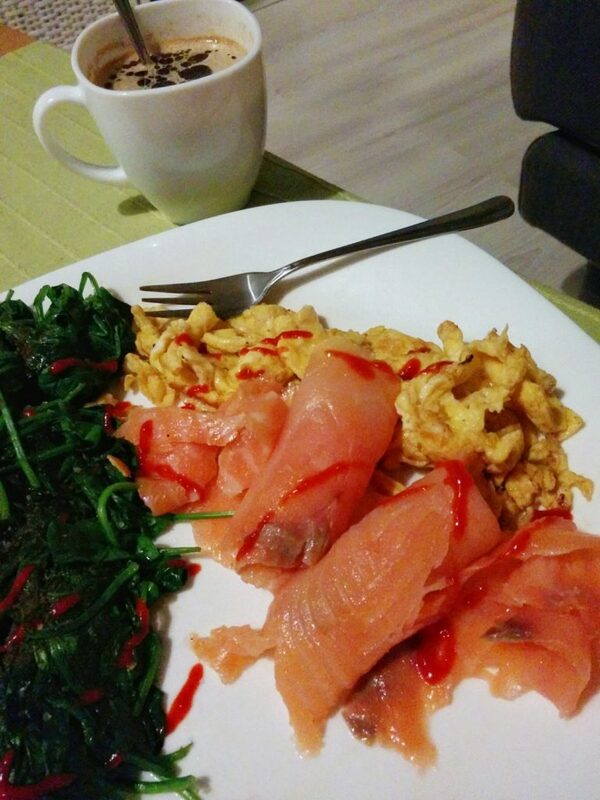 My favorite workday breakfast during my keto diet was scrambled eggs with spinach and smoked salmon. It’s delicious, filling and feels so luxurious! Keto feels utterly restrictive and constraining! I never had to measure so much stuff with my kitchen scale… Holding on to my macros was leading in deciding what to eat that week. I was quite strict to myself and planned all my meals around calories, fat, carbs and protein. Instead of choosing ingredients based on their flavor I had to cut ingredients from recipes just to save on those 1 or 2 grams of carbs or add fat that just felt unnecessary. 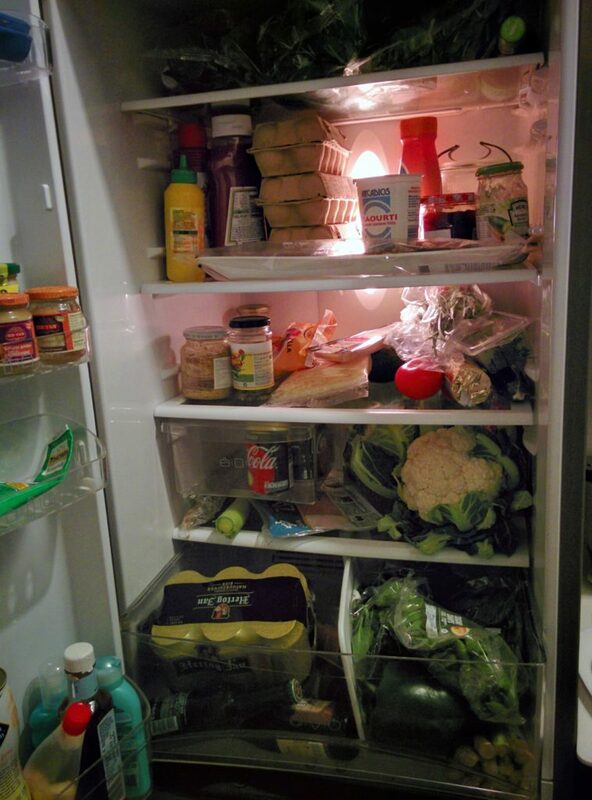 Every Saturday or Sunday I would need to spend around 3 hours to plan every meal and drink for the upcoming week. It really makes it difficult to be spontaneous and made me enjoy social gatherings a lot less. Ultimately, I even avoiding meeting with loved ones just to be able to stick to my diet. This is something I never want to do again. For me personally, a ketogenic diet is not a suitable long-term diet that I can or want to follow. The worst cravings I have are not about pasta, chips or chocolate. I crave fruit! I crave it soooo much! One of the first things I bought after my keto diet ended was a pineapple! Oh, how I missed the humble pineapple! Keto means sticking mainly to everything that is green when it comes to vegetables, but I want to eat the whole rainbow again! I learned a lot, but for me it’s too restrictive and it took the passion out of my cooking. The only reason why I was cooking was to provide fuel for my body. Cooking suddenly felt like a chore, rather than the pleasure and meditation that it usually is for me. As cooking is such an important part of my life I’m not willing to let this passion go! Update and a word of caution: From the 6 kilos that I lost, I put on 3 immediately afterward, because muscles simply hold on to more water, when you consume carbs. So half of the weight loss on the scale was water-weight. The rest I put on shortly later again. As most people do, that follow a short-term diet. Following a ketogenic diet helped me to deepen my knowlegde about food, nutrition, and macro’s nutrients. I don’t think it’s a healthy approach in the long term. It will help you to lose weight rather quickly, but you are almost certain to add these pounds again, once you go back to your old eating habits – as is true with pretty much all short term diets. It was more meant as a self-experiment because I simply could not believe that it would work. It did work and I picked up some new healthy habits. I have also lost my “fear of fat”. If you want to lose weight in the long-run, keto is not a viable solution! Crash-dieting is ALWAYS A BAD IDEA! A balanced diet is the only way to maintain your goal weight in the long run. Eating balanced is not the easiest way, but it’s the healthiest and most sustainable one. Download the free keto dashboard to help you track your carbs! If you are still interested in trying keto or low-carb you can use the free excel dashboard I build. To make my own life a bit easier and track my carb intake, I threw together a little dashboard in Excel. This file really doesn’t do magic and only uses very simple Excel formulas, but for me, this was still easier to use than calculating everything by hand or using commercial alternatives like MyFitnessPal. I added all the foods and ingredients that I eat on a regular basis to make it quick and easy to calculate my daily intake. Just calculate your own macros and fill in every day what you eat. Or even better, plan your days in advance. Optionally you can add your own ingredients and make dummy calculations. The dashboard worked for me, but I can imagine it doesn’t work for others. Feel free to change this file in any way you like!!! So what do you think about the ketogenic diet? Did you share a similar experience than me? Have you ever tried to cut out all carbs out of your diet cold turkey? Interested to hear your personal stories! Comment underneath or send me an email!